Teens from around the Valley are busy perfecting their recipes for an epic Iron Chef style competition for the title of Top Teen Chef in Arizona at the Scottsdale Culinary Festival on April 16, 2016. A brand new element at the Scottsdale Culinary Festival, admission to the Teen Cook Off is included with admission to the Festival. The competition will take place in the Virginia Piper Theatre where patrons can grab a seat and watch the teens battle it out for amazing prizes. We’ve noticed a growing interest in skills based programs for teens with culinary arts programs popping up around valley high schools. So, we wanted to give these teens a platform to show off their skills, meet some of the valley’s best chefs and mingle with our thriving foodie community,” said Thomas Cooper, Vice President, Scottsdale League for the Arts. Presented by Whole Foods Market, the Teen Cook Off will be held on Saturday, April 16 from 1-3:30 p.m. and at 6 p.m. for the final rounds. Six teams of two will compete, with the winning team set to receive a $500 gift card to Whole Foods, a kitchen start-up package and scholarship money toward attending a local culinary school. Space is still available for teams to sign up, currently students from Paradise Valley High School and Phoenix Union School District are in the running with more to be announced soon. 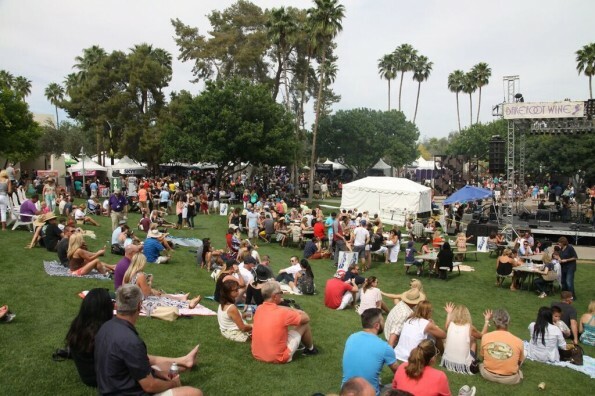 Hosted by the Scottsdale League for the Arts, the Scottsdale Culinary Festival highlights include 40 local restaurants, 30 craft breweries, 20 bands, a teen cooking challenge, chef demos, family zone, wine garden, and a vodka lounge. Participating restaurants for 2016 include (so far): The Neighborhood Treatery, Grimaldi’s, Roka Akor, Sushi Roku, Honey Bear’s BBQ, Pita Jungle, The District, Delice Bistro, Inchin’s Bamboo Garden, Dakota, SanTan Brewing Company, Roy’s, Pork on a Fork, Marigold Maison Indian Cuisine, Crust Restaurants, Crab & Mermaid Fish Shop, Cien Agaves, Black & Bleu American Grill and more. The 25-acre Scottsdale Culinary Festival grounds will feature eleven themed zones jam packed with interactive experiences to taste, sip and celebrate the Arizona food culture. Access to all zone activity is included in the general admission ticket pricing, with the exception of the VIP zone and the Southwest Festival of Beers. Hosted by Blue Moon, the Southwest Festival of Beers will feature 200 specialty beers from local and national craft breweries, food from local restaurants and beer games. In the Culinary Experience Tent education is the focus with a mixology demo, chocolate making demo, meet the brewers panel, food photography seminar and urban farming seminar. When: Saturday, April 16, 2016, noon – 9 p.m.